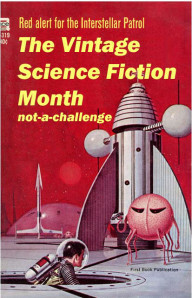 Vintage Sci-fi Month is still going on, and here’s my official post for it. For more vintage goodness, including some good essays on what the hell vintage sci-fi is, head to Little Red Reviewer’s blog. The Dying Earth is such an integral part of the genre that it feels as if you’ve read it even if you haven’t. It’s like getting all the Star Trek references in conversation even if you haven’t seen a single episode. You absorb it by osmosis, though in this case the message got a bit garbled, methinks. Let’s look at the Wikipedia page for The Dying Earth, shall we? Turns out, it was voted one of the best novels in the 1987 poll conducted by Locus magazine. Novels? Wait a second. Sure, all the parts of it are set in the same world, and there are the same people who keep popping up, but really, if you go into it expecting a novel, you will be very confused. 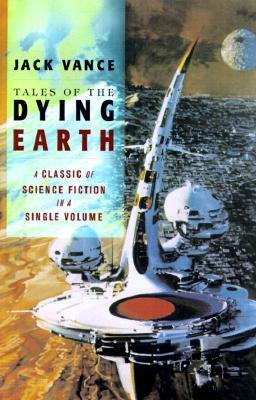 What is even more confusing is that the omnibus edition I own says ‘All four Dying Earth novels in one volume’. I suppose that’s because short stories and novellas don’t really sell. Plus there is this new cover. It’s beautiful, but somehow does not match the contents. All of the above shouldn’t really matter, except that expectations do affect your reading experience, and I can just picture people starting The Dying Earth and throwing up their hands, going ‘WTF is this? And why do I feel like I’m reading some ancient sagas?’ Well, it’s because you are. Reading sagas, that is. The Dying Earth is not a novel. It’s not really even a collection of short stories. It’s a collection of myths. People obey strange unwritten rules and speak in riddles. Archetypes abound. People go on quests. There are wizards. It’s like Silmarillion, but for a different universe and mythology. Once you know that, you can relax and immerse yourself in the Dying Earth universe. And it’s a fantastic place. Vance is a master when it comes to the creation of setting and atmosphere. In The Dying Earth, his writing has a lyrical, wistful quality to it. It’s the style perfectly suited to the content, to the idea itself of the sun being slowly extinguished. It has a certain finality to it, and a sense of loneliness. Anything is possible and yet the time is running out. People are ‘feverishly merry’. The stories all have a common theme (besides the Earth dying), and that is acquisition and preservation of knowledge and how to use it in the time remaining. The first story starts by Turjan of Miir going on a quest because he is promised knowledge at the end of it. The other stories continue with the idea of traveling to gain wisdom, to find something new, to boldly go, as it were. As fun as these stories are, I don’t think the omnibus is for reading from cover to cover. I myself found it easier and more enjoyable to read Vance in small doses. So that’s my caveat to the reader: Vance is for tasting, not for binging. Oh, and if ‘you can only hold four spells in your head’ idea takes you back to your D&D days, here’s a great little piece on The Dying Earth as it relates to gaming. My friend said he was reading The Dying Earth books in order to know his ‘geek heritage’. Finally: is it actually sci-fi? Or is it fantasy? You see, the lines were much more blurry in 1950. It’s both, or it’s neither. See my note about it being a collection of myths. I love the comparison of the book to the Silmarillion. I get where you are going with that and I agree. I have that same omnibus and have read The Dying Earth and then the second story, Eyes of the Overworld…or is it Overlord? I knew going in that The Dying Earth was a collection of related short stories and that happens to be one of my particular likes so I really enjoyed it. It does have a saga feel to it and the stories feel like the kind of science fiction that I read when I was a kid, only somewhat different because Vance was a very unique writer. The more I read his work the more I see how he influenced so many writers who have come afterward. Great choice for Vintage SF Month. I feel that Vance is almost in his own category (though in my head he often shared that category with Moorcock and Wolfe). We picked The Dying Earth for our sci-fi bookgroup this month, and it was interesting to see different reactions to the book. Some people loved his writing, some people were quite put off by it. I can easily see that. When I read this a few years ago I was blown away, and my best friend read it later and was sort of indifferent about it. I’ve read some of his other short fiction which goes out on a limb a bit more than these stories and I have enjoyed that as well. Speaking of Moorcock, I finally the first three Elric books this past year. Really connected with them. I’ll read more this year as I received some Elric for Christmas. Speaking of Moorcock, his Dancers at the End of Time is also of the Dying Earth subgenre and has a similar feel, as I recall. Great review! How on earth did I miss this one? January is always busy for me. Yes, on the cover– it’s great, but doesn’t match. It does require sips– it took me a full month to get through all 700 pp. (I nearly dumped it during the final volume, so boring.) The middle feels much more cohesive and storylike and entertaining.